We had the opportunity this week to hear Brad McCoy speak at a charity fund raising dinner. Brad is the father of the former University of Texas quarterback Colt McCoy who led his team to the national championship Rose Bowl game in 2010. During the game Colt was injured and unable to return to fulfill his dream of wining the National Championship game. In the locker room while realizing his injured shoulder was not going to allow him to return to lead his team Colt told his dad that he “had them“. He knew what they were going to do before they would do it and was on his way to winning the game. And then it happened, his dream and his ability to lead his team to victory was over. How do you prepare your son or daughter for these moments? “Prepare the child for the path, not the path for the child” – Brad McCoy. Brad and Debra were intentional in finding daily teachable moments to prepare their boys for the path that life would bring. The cumulative result of these teachable moments prepared Colt for this courageous and God glorifying statment in the most difficult and disappointing moment in his life. In our home life raising our kids or in our business life leading and managing our companies, being intentional and spotting teachable moments to coach your family and co-workers requires discipline. It requires discipline to prepare your mind to think higher thoughts, see through others eyes, hear through others ears, and have the spirit to speak the right words and wise counsel that the moment requires. As a mom, dad or manager you must prepare yourself for these moments. I am writing to suggest a few things to do to put yourself in a position to recognize and take advantage of these teachable moments. Give yourself some margin – You must have time in your day to refuel and gain perspective. This is impossible if you run too hard and have no down time. Carve out some time daily, weekly, or quarterly as is right for you to step away reflect and recharge. Be disciplined to fill yourself with knowledge, wisdom and ideas – Give yourself the advantage of learning from others. Read books, listen to speakers, go to seminars and fill yourself with the knowledge and wisdom learned from others so that you are prepared and have the tools in the moment. Pray – Earnestly seek wisdom and pray that God would open your eyes to be sensitive to the moment. Pray that you would see with God’s eyes, hear with God’s ears, and be filled with God’s spirit to have the right words to say or when silence and a reassuring hug is best. Love – In all you do to develop and lead do in love. When words are not enough or when there are no words to say love will cover all. It is my prayer that you will lead your family and your organization with love. In many ways we prepare a smooth path, but we also must be disciplined to prepare ourselves, our families, and our organizations we lead for the rough patches that surely come in our path. I Thessalonians 4:6 – Let your speech always be with grace, as though seasoned with salt, so that you will know how you should respond to each person. 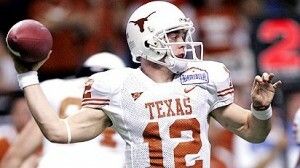 This entry was posted in Family Leadership, Rites of Passage and tagged brad mccoy, colt mccoy, Rose Bowl. Bookmark the permalink.